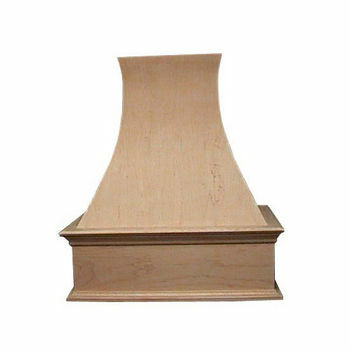 This Air-Pro Decorative Curve Wall Mount Range Hood features high-end style and quality. The hood is constructed from any of four different quality hardwoods including Red Oak, Maple, Hickory and Cherry. The woods are unfinished so your range hood can be painted or stained to match your kitchen cabinets or range. This range hood is available in 36”, 42” and 48” widths to accommodate most range sizes. Re-circulating ductwork kits are also available. Four stars because there are no installation instructions or easy way to install the piece. That would be a huge improvement to the product. Beautiful woodworking otherwise! Yes, item FU-FDWHDC48C is made from cherry wood. It would be sent unfinished, and you would have the option to either paint or stain the hood to your preference. If you have a 36" cooktop, using a 42" hood would work if you have the space, as it is recommended that you have a 6" overhang on each side if you have the room. This is a wall mount hood, so if you have a soffit or bulkhead, this would mount underneath that. The hood height is 42" H, so you may need to then trim the hood height if it's too tall. The best wood for painting would be the maple wood. No, unfortunately the smallest size is the 36". When FU-FDWHDC36H is made, it does include the trim, unfortunately there is not an option for later installation.